Photo: Abbie Trayler-Smith Stick Action Man in the draw, fidget and think about girls. When that all gets a bit much, rush for a guitar. Find that your mates have already done the same. Form a band and try to take the noise you fill a cold garage with, down to the local. Sing your dwarved heart out to an audience ten years your senior until someone notices you. Before you know it, bus drivers think it memorably witty to greet you with an alright, and kids are out to mimic your facial hair, forcibly cultivating sideburns. Gaz Coombes, now definitely Gareth to all present, stands a decidedly well-versed 21 year-old. Hair now recovered from the crew cut that last year was too well reported to win him any anonymity, he sports a halfway bushy facial rug, a nod to the mood of the moment. All the outward signs of maturity are there; the effortlessly brilliant second LP, the sure-footed decision to stay off the promotional bandwagon, but the grown up Supergrass are, like Gareths beard, a little scatty around the edges. Their nonchalant approach to the press and the industry generally is, on closer inspection, in need of a few more years of grooming before it sits as fully formed as their records. For Supergrass, despite their impossibly adult fluency as musicians, make for the lousiest of pop stars. But the big news today is not that a career as a notable musician is not built on tunes alone. Todays news is far from public knowledge. 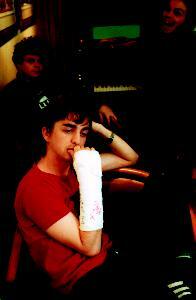 Last night Danny broke his wrist punching a car. There is a tidy irony in the fact that what makes for a great tale of rock n roll abandon is also the source of some embarrassment for this drummer. Hes had to tell the road-crew and support (the glam sham Spacehog) that theyre going to be twiddling their thumbs for the next twenty days, and, more directly Mickey and Gareth are out of a job until he heals. Their dates suporting Oasis look safe at present, but they look a little disappointed on the whole, crammed in to the conference room of one of Nottinghams more bar-pricey hotels, though this may just be the effect of the company theyre in. Where better to see how Supergrass deal with the varying shades of the spotlight. The afternoons conference encompasses the promo and press allsorts, be they bottom-end kids whod face chilly Nottingham in their M & S knickers to pose for a family album shot, or rushed, frothy-mouthed management types, busy executing and asserting, headsore from over-exposure to a cellphone. Danny in particular, would probably rather be in bed right now, and its a pity that a little gratitude isnt reflected in the quality of question posed. Its like Kilroy he half-jokes. Close enough, for someone will ask them later if they have any embarrassing sexual antics to relate, if theyd consider endorsing monogrammed Elastoplasts or eau-de-Grass bodysprays, or who the nicest person is theyve ever met. To these, their answers are suitably dismissive. Welcome to student journalism lads. Despite the inexplicable choice of Late In The Day as the last single, In It For The Money proved the band could suit themselves musically and still be a profitable concern. Recorded in the idyllic backwaters of Sawmills studios, it retains the rootsy brattishness of I Should Coco yet is resoundingly less direct and upbeat in its commercial appeal. It is also the sound of a band striking out alone, without the help of Sam Williams, their one-time manager, producer and co-writer.